But while taking steps to reverse the damage being done to the planet is an obvious response, there is a less-obvious – yet equally-important – human element to the process. The field of climate justice considers how policies introduced to protect the planet impact on people and brings the notion of fairness to the debate. It’s a fascinating topic which, as University of Reading Professor Chuks Okereke told me in a recent interview, presents us with an existential crisis as “the people least responsible for contributing to the problem… are the ones most at risk”. Speaking to Connected early on a frosty December morning, University of Reading Professor Chuks Okereke is anything but cold when discussing what fuels his world-leading work on climate change. Far from pondering the painfully-apparent physical impact of global warming in isolation, the academic places the notion of justice at the forefront of the way businesses, nations and the wider international community tackle one of the planet’s most pressing issues. Chuks’ drive to ensure current and future policies address societal inequality as much as environmental concerns is put into context by his passionate response when asked to define his most fundamental value. “For that, I do not have to think twice,” he enthused. “It is justice. I knew from very early on in my life that I hated injustice and that expressed itself at university in Nigeria through student activism. “We fought the government of the day for democracy and better policies and for that I paid a great price; I was regularly locked up. That was where my character was forged, in the crucible of fire of activism. While his days on the frontlines of protests may be consigned to the past, Chuks’ intellectual activism carried out from the University of Reading is having a real-world impact by expanding society’s understanding of the governance of climate change. On an international level, this focuses on conceptions of justice and the tensions states feel when trying to reconcile environmental, economic and justice concerns. For example, if richer countries dominate discussions around climate change policies, can poorer nations ever truly negotiate deals that they deem to be fair? For someone with such an ingrained sense of fairness, this disparity between the developed and developing worlds resonates particularly strongly with Chuks. “Climate change is an existential crisis because people’s lives are at stake,” he explained. “But it is a time issue too because the people who are least responsible for contributing to the problem – at least in the historical sense – are the ones most at risk. The notion that the developing world will bear the brunt of a deteriorating environment is backed up by even the most optimistic of forecasts. In Africa in particular, the prospects of desertification, rising sea levels and worsening droughts place the health of the continent – and its people – under acute threat. With action needed in the present to help protect the future, Chuks is at the forefront of the development of “green growth”. By working directly with African countries, he encourages low-carbon strategies that enable nations to tackle climate change and address poverty. His expertise has already been harnessed in Rwanda, which he assisted in devising Africa’s first national green growth strategy, and he plays an active role in helping Ethiopia understand the trade-off between the green economy and old-style industrialisation. The roots of green growth are also beginning to take hold in Kenya, South Africa, Morocco and Egypt, but Chuks believes the continent needs to see words replaced by action in order for meaningful change to occur. He said: “There remains a big disconnect between rhetoric and practice because I haven’t seen many countries take aggressive steps to tackle climate change. Alongside influencing international policy and changing behaviours on a national level, Chuks throws his intellectual weight behind fostering a greater understanding of the role of businesses in tackling climate change and understanding the social impact of their work. With just 90 carbon-intensive companies responsible for the generation of nearly two-thirds of all greenhouse gases since the industrial age began and around 57 per cent of the UK’s emissions coming from FTSE 100 companies, the corporate world has a huge part to play in the fight. The magnitude of the issue means that large-scale impact requires the concerted input of the international community. Its efforts to arrest the development of climate change include the Paris Agreement which, under the United Nations Framework Convention on Climate Change, asked countries to determine their own contributions towards dealing with greenhouse gas emissions from 2020 onwards. 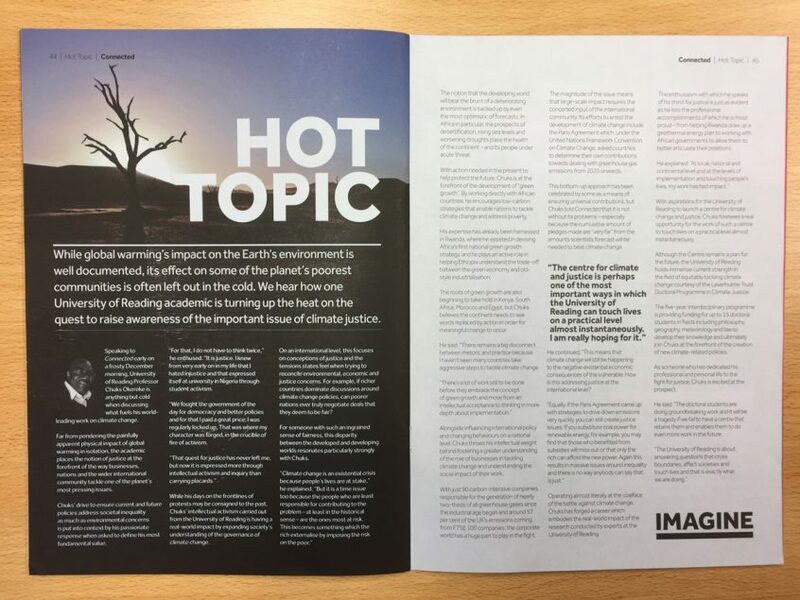 This bottom-up approach has been celebrated by some as a means of ensuring universal contributions, but Chuks told Connected that it is not without its problems – especially because the cumulative amount of pledges made are “very far” from the amounts scientists forecast will be needed to beat climate change. He continued: “This means that climate change will still be happening to the negative existential economic consequences of the vulnerable. How is this addressing justice at the international level? “Equally, if the Paris Agreement came up with strategies to drive down emissions very quickly, you can still create justice issues. If you substitute coal power for renewable energy, for example, you may find that those who benefited from subsidies will miss out or that only the rich can afford the new power. Operating almost literally at the coalface of the battle against climate change, Chuks has forged a career which embodies the real-world impact of the research conducted by experts at the University of Reading. The enthusiasm with which he speaks of his thirst for justice is just as evident as he lists the professional accomplishments – from helping Rwanda draw up a geothermal energy plan to working with African governments to allow them to better articulate their positions – of which he is most proud. And with the University of Reading hoping to launch its own Centre for Climate and Justice as part of the IMAGINE campaign, he has plans to further embellish a career which he admits has already seen him have “more impact than many academics could hope for in their lifetime”. He explained: “At local, national and continental level and at the levels of implementation and touching people’s lives, my work has had impact. Although the Centre remains a plan for the future, the University of Reading holds immense current strength in the field of equitably tackling climate change courtesy of the Leverhulme Trust Doctoral Programme in Climate Justice. The five-year, interdisciplinary programme is providing funding for up to 15 doctoral students in fields including philosophy, geography, meteorology and law to develop their knowledge and ultimately join Chuks at the forefront of the creation of new climate-related policies. As someone who has dedicated his professional and personal life to the fight for justice, Chuks is excited at the prospect. He said: “The doctoral students are doing groundbreaking work and it will be a tragedy if we fail to have a centre that retains them and enables them to do even more work in the future.